The floating timber market of Barisal was started in 1918 on a canal of Sandha river based on the logs coming from Sundarbans. Trading the signature “Sundari” tree of Sundarbans, the largest mangrove swamp in the world, was the main business here on that time. After putting ban by the govt. on trading Sundari tree in 1987 to protect the forest, the tradesmen started trading other trees on this market coming from different parts of the country. Being located on the heart of Ganges Delta, Barisal has a great network of river connected to the whole country, which was the main reason for this market to become very popular. People could easily transport big logs here through the river from all over the country. Transporting logs has become very easy and cost effective because of the river. They tie logs on both side of an engine boat floating on water and move very slowly. Sometimes there are 10-15 boats tied together with loads of logs tied both side of them, and an engine boat drag them from the front. This is a common scene before the 02 market days of the week – Monday and Thursday. They sell these logs sitting on the boats, which make this a floating log market. This is the largest market of it’s kind in Bangladesh. There are also permanent timber shops on the bank of the river. They dump the logs on the river bank and sell from here – 7 days a week. Every log has an unique number from the shop. Lifting and transporting the logs are done using the favor of tide, which makes it less laborious to do manually. People come here from everywhere of the country. They buy logs, and chop them in the numerous saw mills according to their needs. There are about 200 saw mills around the floating timber market to do this. Buyers are mainly the owner of furniture shops from all over Bangladesh. About 13-14 hundred people work based on the floating timber market of Barisal. When there is no work, people gather in the huts on the shore drinking tea and socializing. It could be a great experience to have couple of cups of tea with them and hang around for a while and share culture. Other business also flourished based on this market. A cottage industry is grown here to make local cricket bats because of the cheap timber available on this market. Also grown dozens of nursery to sell trees to plant, which itself has a different floating market in Barisal, and would be another story to tell. 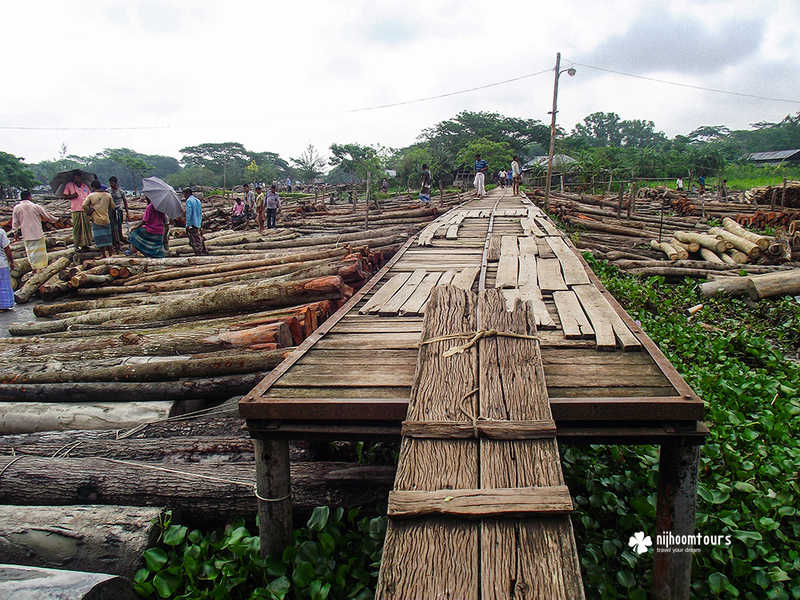 Have you ever visited the floating timber market of Barisal in Bangladesh? How amazing have you found it? Share your thoughts and experience with us in comments. Check out our Backwater Photography Tour to experience life on Ganges Delta at Barisal including visiting the floating timber marker.